The sad fact about modern weird-for-weird’s-sake micro-indies is that they tend to be even more alike that than the toothlessly quirky Sundance items to which they’re supposed to serve as an antidote. It’s like they’ve all been grown from the same frothy mixture of Adult Swim anti-comedy, vintage lens fetishism, and male pattern baldness. Every now and again a movie like Rick Alverson’s Entertainment might crawl out of this mad-science vat, but more often than not, it’s something like Janicza Bravo’s Lemon, a comedy about a Los Angeles actor (Brett Gelman) who endures one surreal humiliation after another while doing a generally piss-poor job of keeping it together in the face of an impending break-up with his blind girlfriend (Judy Greer). It’s been a few years since the quintessential micro-indie weirdster Quentin Dupieux stopped churning out sporadically irritating and hilarious movies like Rubber, Wrong, and Wrong Cops, and it seems that Bravo has decided to take his spot; her style of grotesque, miasmatic Los Angel-ism looks, well, almost exactly like his. But “almost” is the operative word here, because Bravo, a prolific director of short films who has also does TV (she directed Atlanta’s “Juneteeth” episode), doesn’t have a Dadaist end goal like Dupieux. Her debut feature is much more conventional than it initially lets on, a hack sitcom—complete with lame jokes about talent agents and commercial auditions and an overbearing Jewish family composed mostly of character actors—trying its hardest and loudest to come off as freakish and off-putting. Because behind the bendy anamorphic lenses, tableau master shots, kooky music choices, and affectless performances is another kind of over-familiarity. It really starts to sink in once Gelman’s character, Isaac, begins sort-of-dating Cleo (Nia Long), a saintly makeup artist whom he meets at an ad campaign shoot, leading to all kinds of flimsy culture-clash hijinks—or at least this movie’s version of them. Gelman and Bravo, who wrote the script together, are married in real life, a fact that somehow makes Lemon’s mix of broad caricature and broader relationship metaphors even clumsier. It’s the sort of stuff a self-loathing Charlie Kaufman stand-in might come up with in a Charlie Kaufman script—like, you know, the protagonist’s literally blind girlfriend. (To be fair, Greer’s character’s blindness sets up some of the movie’s better visual gags.) The bigger problem, though, is that all of this last-minute-art-homework surrealism is rarely all that funny. 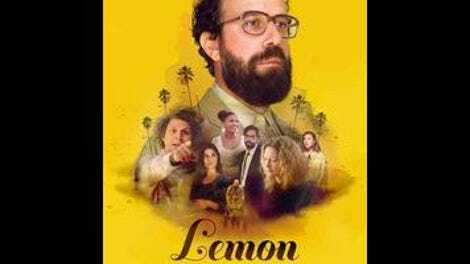 Instead, Lemon’s best bits are more observational or social-cringe-based, like the presence of Isaac’s former therapist at his family’s Passover Seder or the relationship between Isaac, who teaches a Chekhov workshop in a pathetic storefront theater, and his conceited star pupil, Alex (Michael Cera, sporting a Harpo-Marx-meets-Frederick Douglass ’do). Cera, who has appeared in several of Bravo’s short films, gets most of the best lines (“I’ve been using colors in my exploring,” “I’ve been doing a lot of animal work, and not just one animal”), playing to the more dickish side of his persona. In the creepy dynamic between these two losers—which includes their constant, overtly misogynistic bullying of Alex’s scene parter (Gillian Jacobs)—Lemon finds itself on the cusp of something legitimately interesting and uncomfortable. But that would involve going to a place that’s actually weird.